If you're trying to set up a home network, you probably want to set up a permiter facing computer connected to your DSL/Cable modem, and then put all of your computers behind that firewall box to keep them safe. This tutorial will show you how to use a single external connection on the gateway computer (using Iptables firewall), and a second internal connection on the same box so you can connect the computers on the inside of your home/office to it, and automatically give them IP's when you hook them up (using DHCP server). Iptables can be very complicated, we will only configure a basic firewall, you can add more security later without breaking things. In Linux there are many ways to do this, this one is hopefully simple enough and will teach you the basics. I did this on a CentOS 5 box, though it would work on Debian variants with only slight modifications. During this tutorial I'm logged in as root, which you should generally NOT do, but it makes the tutorial simpler, but if you prefer to do it more securely, add "sudo" before each command and it will work. The computers on the inside of your office will also be able to talk to each other, so you can hook up printers, computers and share network connections through the switch as well. You can also set up things on your Gateway server box later like a network backup drive for all your computers using Samba relatively simply. There's a lot of expandability in this setup, but we'll keep it simple for now. The first thing to do on your Gateway server is configure and enable Iptables, the default firewall that comes with CentOS. We will tell it to allow outbound traffic from your eth1 interface to the internet. You have to add an Iptables entry, save it and restart Iptables. You can cut/paste the one I'm using, or just edit yours to suit your needs. A word of caution, your network might be different than mine. This file will give your internal computers a range of IP's from 192.168.0.128 to 192.168.0.254 with a subnet mask of 255.255.255.0, change to suit your needs. You'll also have to make the IP information match on eth1 static IP later if you use your own values here. It should say something like: eth0 inet addr:10.1.10.43, that's the one you want. So now we test the setup. You should be able to go to one of the client computers, hook it up to the switch where your gateway is connected (in my case a cheap home Netgear $30 8 port switch model# FS608) and it should find an IP using your new DHCP server, and you should be able to browse the internet. to tell the firewall what to block. A rule of thumb is to block everything and then only allow what you need, but you can read about that elsewhere in daunting depth if you choose. I had no need for the route add -host command, dhcp worked out of the box. About the ip_forward beeing permanent, it seems more reliable to edit /etc/sysctl.conf as the /etc/sysconfig/network didn't work for me. At last, maybe a DNS cache would be a good thing to add to this tutorial. With DNS filtering beeing deployed by a growing number of ISP, beeing able to aggregate answers from public DNS may be better than relying sollely on your ISP' DNS to handle every requests. It's also way faster on high lantency connections. Now this is awesome! Easy to follow through! I am planning on building a CentOS server for a specialized WAP based portal. Will try to post the results asap. I tried your setup but instead of modem connection to my eth0, i used a load balancer router. eth1 goes to our main switch. is it possible to route internet connection this way? my server is getting internet access but routing at eth1 is not. Thanks for this great tutorial, however I think there is a slight adjustment needed. You need to add the route for which the DHCP server should listen out on before you start the it otherwise you get a fail. Is there any chance of giving IP address on the diagram as an example of what going on. For example. 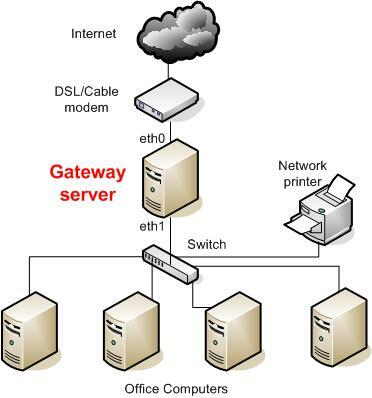 eth0 - IP, Eth1 IP - cable modem settings , DNS setting etc. Is YOUR eth0 card set to 192.168.0.1 or 184.64.87.112 ???? If YOUR Eth0 card is 192.168.0.1 and mine is 192.168.1.10 then I can simply change the setting at the appropriate places to suit. This tutorial needs some corrections to properly work. My hope is that people read this comment so a few things can be corrected. `echo 1 > /proc/sys/net/ipv4/ip_forward` won't cut it. Once you do something like `service network restart`, the 1 in ip_forward will be a 0 again -- that is a major problem with this tutorial. Edit sysctl.conf with `vi /etc/sysctl.conf` and change the 0 in this line to a 1: net.ipv4.ip_forward = 0 ... from there restart networking to route traffic properly. Unlike this article, I have two NICs - eth0 and eth1. I also added a few FORWARD rules to specify the source/destination subnets to allow and drop the rest (shown below). If you're using RedHat/CentOS - any RHEL-based distro that retains the RH-Firewall-1-INPUT custom chain, you'll need to add those rules in the custom chain instead of using the boiler-plate commands I gave above. I just modified `vi /etc/sysconfig/iptables` to configure it. Once your rules are applied either via commands or manually editing the file, save them and restart iptables. Can I ask what IP addresses your using, ie are they the IP addresses of your ISP? Also do I need the MAC addresses of my ISP definately for the DHCP config? If so how would I be able to get these so I can put them in? Sorry just a little confused here, looks good though, will be getting a new computer and want to use a light server for my gateway and then using another as a website development test bed. I am fairly good with networking things though, always on aim to improve my ability within network management, should be allot of fun setting this up. This kind of half baked articles makes me sick, a firewall setup is by far nothing to be taken lightly. I advise all hobbyists to look a some dedicated distro for a firewall/dhcp/gateway solution such as pfsense, m0n0wall, etc. These run on ALIX mini-boards, and can cover even small-business needs (not to speak about power consumption!). Please explain what are the ip addresses of your 2 intefaces. and which one faces outside or inside in this example. Please can anyone explain me or recommend a link about how to configure different DHCP scopes in CentOS server? I have 7 different subnets on 7 VLANs, I easily manage to create the DHCP scopes in WinServer2012 but I can't see any material on CentOS server how to create DHCP SCOPES.